- you might not able to recover the deleted items from outlook if you are connected via Imap account. - Shift Deleted Data are not included in your mailbox size or your Quota. then it will be restored to all your devices and mail apps you are using to access WorldPosta email through. Local mailbox, should we talk about the difference between occurrence such problem in local mailbox Vs online mailbox. Don’t worry, with WorldPosta you can easily restore your deleted items within 60 days after delete. Problem: You may accidentally shift delete messages which means that you permanently missed them. The person who has the privilege to perform this: restore the deleted items is enabled from user level, not just the administrator. 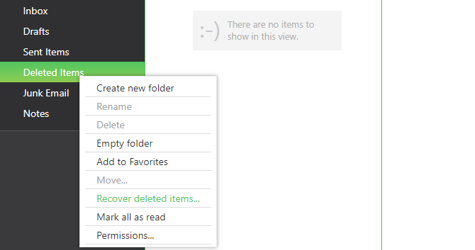 Right-click the deleted folder from the listing in the left menu. All Shift deleted emails will move to the original folder it was deleted from and with its timestamp. Make sure your account is Exchange not Imap. The message will move to the original folder it was deleted from. from the shift deleted container also then it can’t be restored.